The Arlington Dining Chair Grey Fabric has a truly timeless look, providing the perfect way to lend a refined edge to any interior. Whether it is placed in the dining room, kitchen, study or bedroom, the Arlington is guaranteed to make a statement. 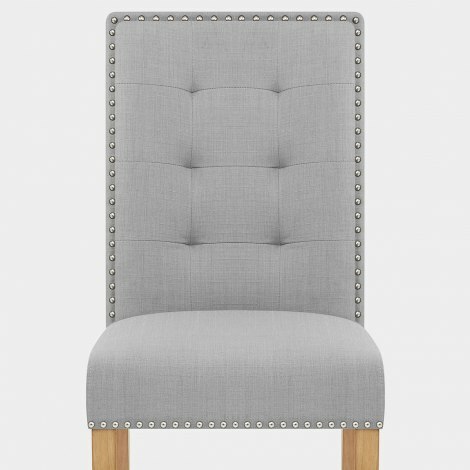 Upholstered in chic light grey fabric, it has a nicely neutral finish that complements its surroundings. Metallic studs adorn the seat and backrest, an ornate detail that augments the classical look of this stylish model. 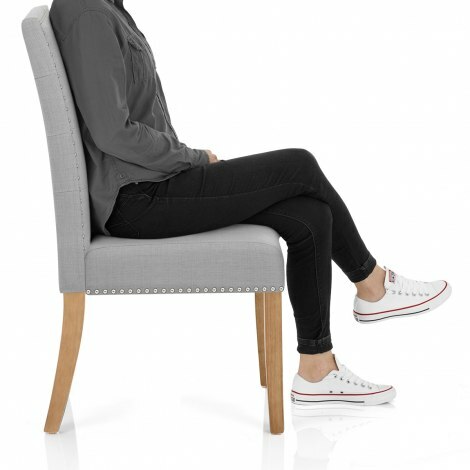 A tall padded backrest with quilted detailing offers excellent support, working alongside the sprung and belted seat for superb comfort. Finished in homely oak, the solid wooden frame provides a robust foundation, complete with protective floor plugs to help to look after your floors. 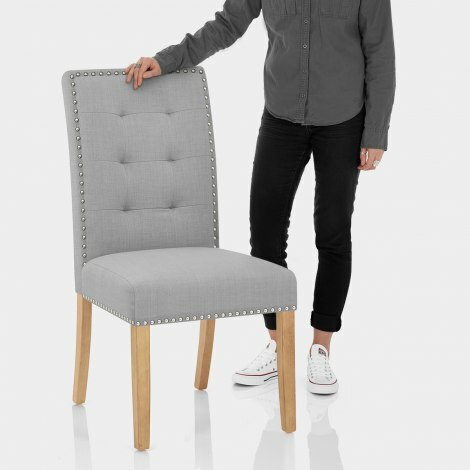 "Chairs are well made and look very stylish"
Excellent value and looks lovely good quality. Lovely, stylish chairs. Very impressed with them. Highly recommend this company as have bought from them before. Really pleased with my chairs great quality and price delivery and customer service excellent. Absolutely love my Arlington Dining chairs! They look so beautiful and feel super comfy. They arrived exactly when they said they would with super fast delivery too. The chairs look identical to the photo on the website. Thank you! Pre ordered 2 extra chairs as I was very pleased with the four I had previously bought. Even though they were out of stock the delivery date was as promised, I cannot fault the Customer Service provided.